The goal is to read a classic for each of the six required categories. There will also be five optional categories for those who wish to read more. For more info and sign-up go here. I've chosen titles for most of the categories but I do have a tendency to change my mind so they may not be what I end up reading. Thanks for joining the challenge! I always end up changing a title or two too.. no worries! Good luck and have fun! Thanks Sarah - can't wait to get started. I love this challenge and I'm doing it too! Great choices! Looking forward to it - and your list! Ah, Germinal! That's my favorite read of this year, you're going to like it. Wuthering Heights is just memorable, isn't it? Who can forget Mr. Heathcliff? A memorable character and a memorable reading, I have never felt more distress than when I read WH. Great choices, Cat! All year I've been reading the positive remarks about Germinal and had thought I might have got it read before now so it was a clear choice for that position. I still haven't decided on this one yet. I tend to sign up for too many challenges. But I do want to read more classics. 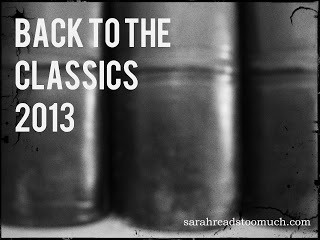 I try to keep my challenges to a minimum but this one will help with The Classics Club list.